Is Features vs. Performance the New Cloud Battle Line? As Amazon Web Services (s amzn) continues to roll out new features and services for its cloud platform, its competitors increasingly tout better performance as a key point of differentiation, which has me wondering if either approach will clearly win out. The past 24 hours — which had AWS announcing the ability to run static web sites almost entirely from Amazon S3 and Joyent announcing benchmark results that show it outperforming AWS across the board — are a microcosm of this features vs. performance discussion, which has been picking up steam for the better part of a year as cloud benchmark results starting becoming public. AWS is known for releasing new features and services at a fast and furious pace, and it’s part of what makes the platform so appealing. Customers using EC2 for virtual CPUs also have access to object storage, block storage, a NoSQL database, a relational database, Hadoop, GPUs, a content delivery network and the list goes on. With yesterday’s announcement, as detailed by CTO Werner Vogels, AWS users whose websites serve largely static content can run the majority of their sites straight from S3, meaning they don’t need a web server always running to serve content, and can offload any remaining application tasks to a dirt-cheap AWS Micro Instance. In AWS’s Northern Virginia data center, its cheapest, a Micro Instance costs just 2 cents per hour, but AWS’s free usage tier gives new users 750 free Micro Instance hours. Not only is this new feature less expensive, but Vogels says it requires a “minimum of effort” on the user side. It’s not that other cloud providers don’t regularly roll out new features, but they certainly don’t do so as frequently and in as developer-friendly a manner as does AWS. Increasingly, competitive providers have been attempting to close this gap by pointing out that not all virtual machines are created equal, especially when it comes to performance. Joyent’s benchmark announcement today is just such a case. 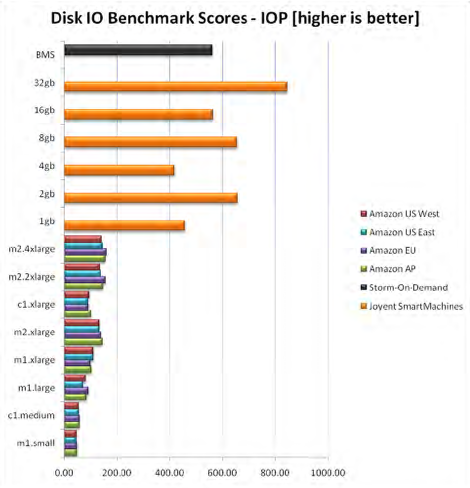 Tests compared various Joyent SmartMachine and AWS EC2 instances across a variety of CPU and I/O metrics, and showed Joyent performing better in every single one, with the highlight being 14 times better disk I/O performance for a Joyent SmartOS machine versus a comparable EC2 machine. At a high level, disk I/O performance is the number of operations carried out between a processor and the hard disk, but these results represent aggregate performance across a number of benchmarks and don’t denote any specific performance metrics, such as I/O per second. Joyent’s performance was less impressive, although still better than AWS, for Linux and Windows (s msft) instances. Joyent isn’t the first cloud provider to tout its performance edge over AWS, though. 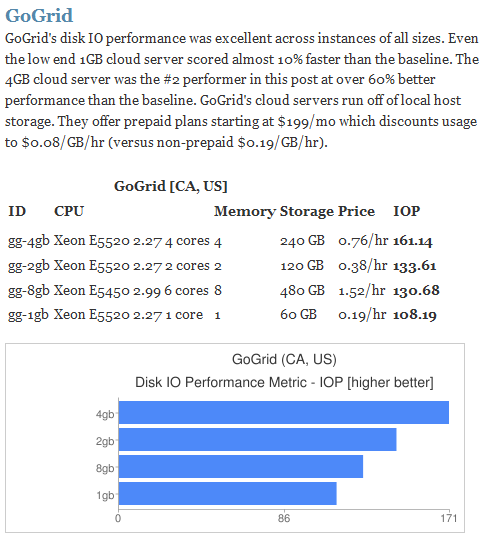 Sticking with disk I/O as the metric, GoGrid, which uses local storage, roundly bested AWS (and just about everyone else) in a spring 2010 test by CloudHarmony, and didn’t hesitate to tell me about it. Joyent wasn’t included in CloudHarmony test, but it did set up its recent test to closely follow the CloudHarmony methodology. All estimates suggest AWS, despite its respectable but certainly not top-of-the-line performance, is crushing the competition in terms of revenue and total users, but I don’t know if that tells the whole story about what users prefer. It’s arguable that a virtual machine is a virtual machine in the sense that they all provide standard image types and are capable of hosting standard applications, but different classes of users have different requirements for what’s underlying or surrounding their machines. It’s very easy to see why some developers would prefer the breadth of capabilities afforded them by choosing AWS, but as larger companies start looking to the cloud and bring more mission-critical web and even internal applications with them, it seems that performance should end up becoming more important. I don’t think a changing of the guard is necessarily on the horizon, with AWS losing its status as the cloud computing mindshare and revenue leader, but as more money comes into the cloud from new users, it might end up getting spread more evenly across a greater number of providers, such as Joyent and GoGrid, that put a premium on performance. Feature image courtesy of Flickr user Andrew Hayward. 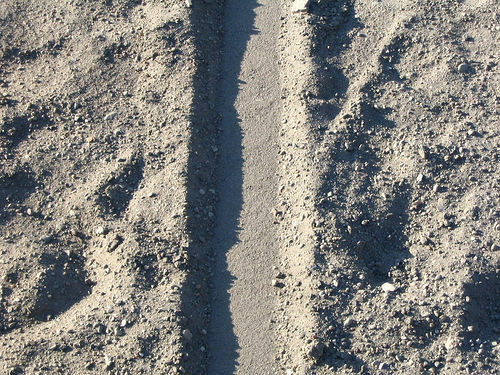 Must Cloud Providers Follow Amazon Down the PaaS Path? Is AWS On Track for $500 Million?